On Tuesday’s podcast: Hunter Hammersen!! Hunter comes to the podcast today to enlighten us all about her adventures in the world of self publishing and what is about to his the shelves! Hunter started out going the “traditional” route of publishing, and teamed up with a publishing house and had a good time, however decided that the route of self publishing was more her cup of tea. She discussed the ins and outs of photography, charts, editing, pattern writing, printing, all the little ins and outs of getting your designs out “in the wild”. Hunter had some super fun news, as her new book (Ne’er Do Well Knits) was finished printing early, and she was anxiously awaiting the arrival of the UPS guy while on the show with Marly, and warned Marly that if she saw him, she was going to drop the phone and run for the door! Hunter later blogged on her own page the pictures of the boxes and books that arrived at her house, and she was SO excited to get them opened, it looks like it was a bit like Christmas at her house! You can order each of them through her website, OR you can enter in the giveaway below, and be entered to win Knitter’s Curiosity Cabinet Volumes 1 and 2 as well as Ne’er Do Well Knits! So, that brings us to the giveaway this week! As always, leave a comment with Hunter’s keyword, and you can be entered to win!! You can find Hunter on: her website/blog, Twitter, and Ravelry (where you can also purchase Hunter’s individual patterns). Awesome podcast!! I love Hunter’s designs! Her new sock design, Scoundral, is absolutely gorgeous!! Thank you for the chance! There are a few scoundrels I’d love to knit for. Can’t wait to see your new collection, Hunter! I love the cables on scoundrel! Thank you for the opportunity to win your beautiful patterns! I love scoundrel to the max! Great discussion. I love seeing all the pirate scoundrels at halloween, maybe I should knit an eyepatch for one! Hunter’s patterns are absolutely beautiful. And what a generous giveaway! I’d feel like an absolute scoundrel if I won. You scoundrel is what I call my cat when she starts to go for the yarn I’m working with. Just recently switching to knitting from crocheting and would love to get my hands on her giveaway. I love Hunter’s patterns. The collections are so cohesive, not a scoundrel in the group! I loved hearing about Hunter’s creative process and how her books go from imagination to reality. She’s such a scoundrel, rebelling agaisnt the publishing companies. I’m definitely going to check out her patterns now. Great podcast, loved you both. And will be naming you both as scoundrel’s if I don’t win this prize. (Just kidding). Great Podcast with Hunter! I was such a scroundrel and hurried to purchase her new pattern book during the discounted time ! Would LOVE the entire set! Thank you, Hunter and Marly! Thanks for another fascinating interview! I’d be a scoundrel myself if I didn’t say these patterns are gorgeous! Thanks for the very interesting discussion of self-publishing! I love that name, Scoundrel, for a sock! 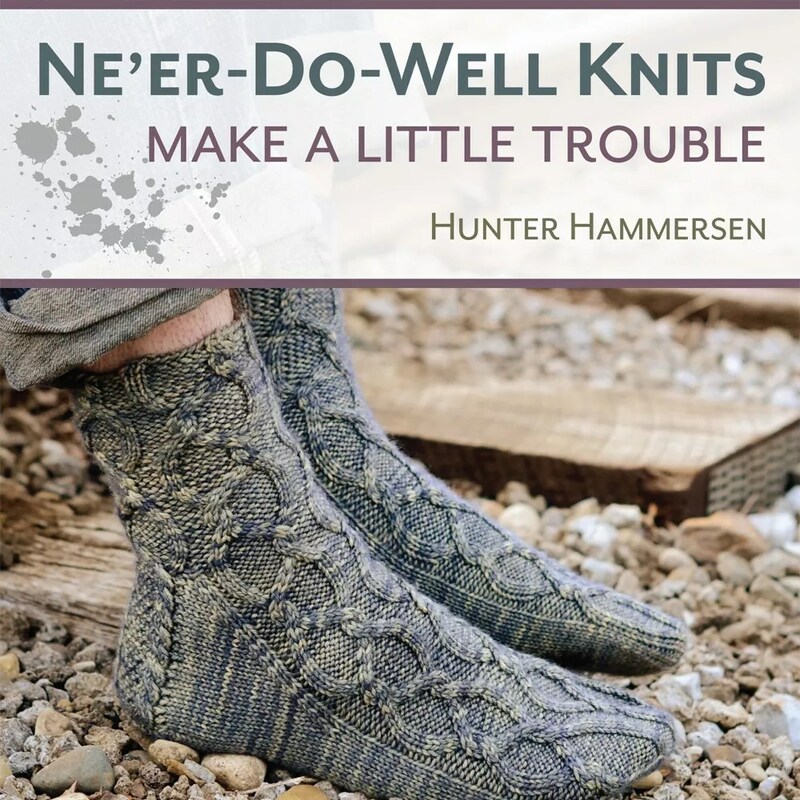 I am new to Hunter’s patterns, but socks are my favorite thing to knit so I would love to explore what her books have to offer! I love the interview with Hunter. My dog is a little scoundrel when she tries,to bite my yarn. Love the info on self publishing. I enjoyed the interview with Hunter and her Scoundrel socks look fantastic. I Just finished my first pair of Hunter Hammersen socks. They were beautiful! Can’t wait to knit scoundrel! Thanks for another great podcast. I have never heard of Hunter before and you have opened my eyes to her beautiful designs! I don’t know which pattern I would want to start with! I love the names that she came up with for each pattern, I really like the scoundrel pattern and vandal! I love the name of her latest book – surely she has run across a scoundrel or two. Great interview, and thanks for the chance. Thanks Marly and Hunter! Enjoyed the podcast as always. I would love a chance to win scoundrel!!!! I have knit many things, but have yet to knit socks. Hunter’s sock designs are absolutely stunning… perhaps Scoundrel socks will be my first? Only a literal scoundrel will get in the way of a knitter and her knitting! This was a great episode, thanks always for your laugh Marly, your enthusiasm is contagious!